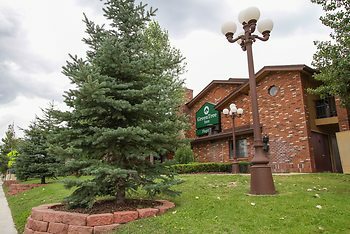 Hotel GreenTree Inn Flagstaff, Flagstaff, United States of America - Lowest Rate Guaranteed! With a stay at GreenTree Inn Flagstaff in Flagstaff, you'll be within a 10-minute drive of Northern Arizona University and Coconino County Fairgrounds. This hotel is 16 mi (25.8 km) from Arizona Snowbowl and 26.5 mi (42.6 km) from Oak Creek Canyon. It was a nice hotel, generous free breakfast, and close to shopping and a few restaurants. We were on the first floor which we prefer so we don't have to lug suitcases up the stairs. However, the ceiling squeaked every time the people above us walked on it, disturbing our sleep. The hotel was great. Great customer service. Great price. Great location. Great parking. Great accommodations. Great continental breakfast. For the price there's no reason to stay anywhere else. Thank you Green Tree Inn. The hot breakfast was great. Loved the biscuits and gravy and omelette. Check in had very personable young man-quite helpful. Bathrooms need updating with paint, not the cleanest in corners. Pillows were mushy. Staff was friendly. Had a great hot breakfast, with a large variety of good things to eat. The front staff were very friendly and helpful. The hotel was clean for the most part. Clerk was friendly and helpful with our late night check in. Beds were firm, which is what we like. The sink to our room was very leaky, but we were able to deal with it.